Lilly Pilly is a fast-growing evergreen native, widely found across Australia, enjoyed as bush tucker for generations. As a psyllid-resistant Lilly Pilly variety, the Tucker Bush Cherry is a very popular choice for landscapers and home gardeners. 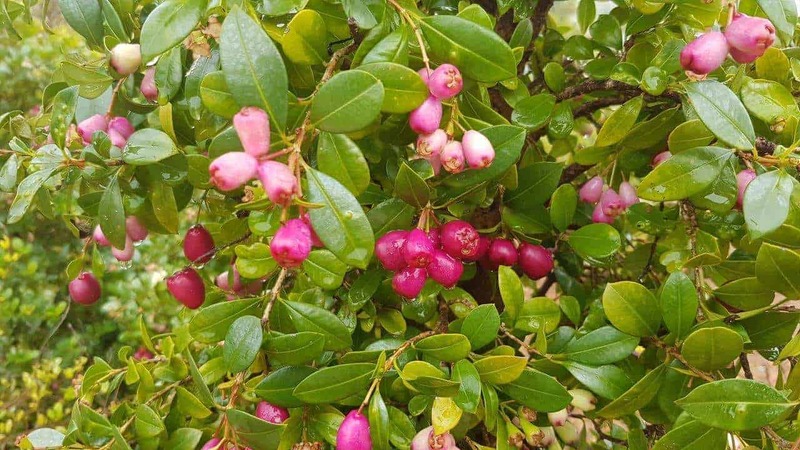 In the Summer, this plant produces edible red berries that are apple-like in texture with a mild sweetness. They may be eaten freshly picked from the tree, or made into jams, jellies, muffins, biscuits, cakes and wine. Flowering begins in late-Spring/early-Summer with clusters of white fluffy flowers appearing across the branches. 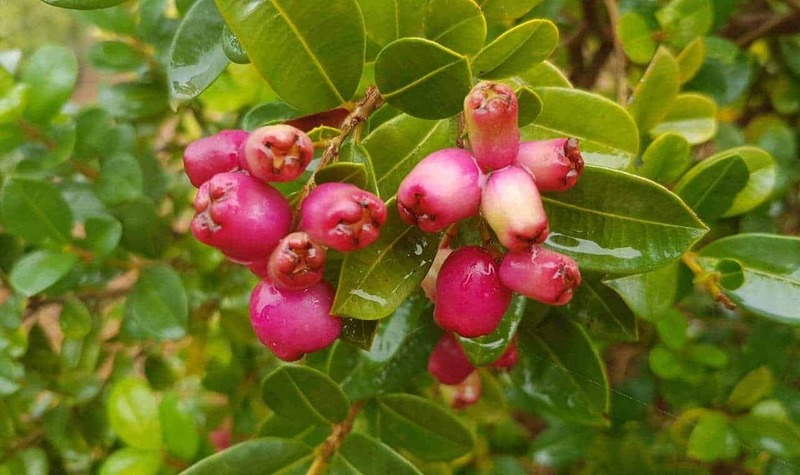 Fruits start out pale, but are ready to harvest when they turn pink or dark red. Tucker Bush Cherry is a hardy species that tolerates dry conditions and most soil types once established. However, as a rainforest plant, it prefers rich, well-drained soils kept moist throughout the year. For best results, plant in full sun or part shade. Its green oval leaves start out bronze, turning deep green and glossy as they mature, making this tree a stunning addition to an ornamental garden. Though it usually reaches up to 3-4m high and 2m wide, this tree can be easily kept as an edible hedge at 1m high. Prune regularly to promote new growth. Do I need to fertilise my Tucker Bush Cherry? Yes, add a slow-release fertiliser in Spring. What are psyllids and why should I care that the Tucker Bush Cherry is resistant? Psyllids are tiny sap sucking insects that cause disfiguring bumps on the leaves of many Lilly Pilly varieties — but not this one! As a psyllid-resistant variety, its leaves stay bump-free with the added benefit of not contributing to the pest population in your backyard. And of course, less spraying for you. How much water does Tucker Bush Cherry need? As a rainforest species, this plant does best when the soil is kept moist (but not waterlogged) throughout the year. However, this selection is surprisingly waterwise and will survive twice weekly watering in summer. Be sure to mulch well in Summer.